No human being lives without experiencing the duality of life. Good and bad. Love and hate. Life and death. Acceptance and rejection. Success and failure. Joy and jealousy. Compassion and judgment. So why do we spend so much time trying to pretend that it’s bad to experience all of it, the good, the bad, and the ugly? Even our weather men and women tell us it’s a going to be a bad day because it’s raining or snowing. I mean, come on! The earth rejoices when it rains; snow is a natural part of our eco-system. Why do we try so hard to suppress the difficult feelings and experiences in our lives? Because our brains are wired that way? Because we were traumatized? Because our parents, teachers, and God knows who else told us to? Does it really matter, as we heal, who, where, and why? I knew instantly that if that was true, I was in trouble because I had a lot of thoughts I wasn’t proud of and never voiced out loud. I was taught at a very young age not to “rock the boat” or be “too dramatic” and the worst, “Your mom is unhappy because of you kids.” Yikes! So, when things got bad at home or at school or at church, they got stuffed. In me. In my heart. In my gut and in my head. On the outside I looked fine. Cute, bubbly, artistic, smart. But on the inside I was scared, confused, and anxious, and did not have a clue how to interact comfortably with people. I tried really hard (unsuccessfully) to fit in. Luckily, I had the outlet of art. I drew, I painted, I sewed, I made batiks—whatever I could get my hands on in the art department at the Catholic High school I went to, or whatever my mom would let me touch at home. She was an amazing seamstress, but, with eight kids, had neither the time nor patience to teach me. Luckily I’m old enough that we had “Home Ed” in high school, so I learned to sew well enough that my mom would let me use her sewing machine. Being creative got me through high school and into college with no major consequences. I wasn’t insecure, lonely, or in need of an outlet. I didn’t drink too much, I wasn’t promiscuous, and I didn’t do drugs. Fast forward a couple decades and I can tell you that eventually, I did experience the consequences of trying to drink my thoughts and feelings away. I stayed pretty creative as long as I could, but, as life goes, I grew up, got married, had kids, and started to work. I could not deal with what was going on inside of me. I started to drink more and more to squash what I was feeling. Within a few years, the addictive gene in me eventually cried out “GOT YA!” and I was lost. And this is what led me to the finding peace through being creative again. My crisis. My breakdown. An intervention with beautiful, sober women, who didn’t know me but wanted to see me find myself again led me to being creative again. These women had been learning how to draw and paint from a friend who eventually became my sponsor. “Whatever this is, I’m in!” I said, and I was on my way home. Home to my true self. 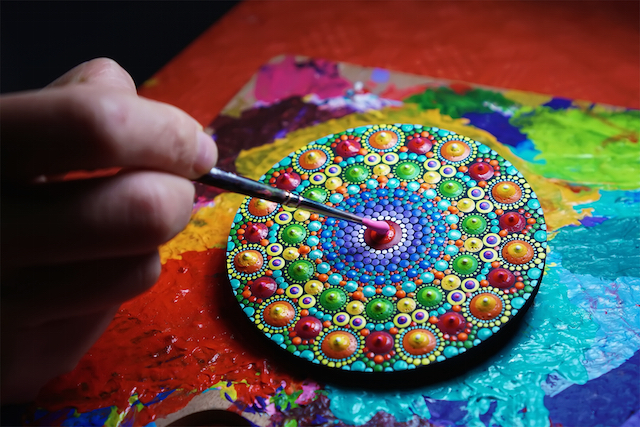 They introduced me to an art form I had never heard of before, mandalas. I had no idea what a “mandala” was. Never heard of it and didn’t care. The mandala teacher had a studio full of every art supply you can imagine and space for many women to create. I was in heaven! As I drew and painted my first mandala, my creative mind took over and the crazy thoughts in my head stopped. I didn’t realize it then, but being creative again forced me to be what we all strive for when we think of being mindful: calm, serene, awake, and aware. My goal was to have fun and be creative again, but what I got was far more than that. I reactivated the divine creative energy we are all born with. When I’m engaged in any creative activity, my “monkey mind” settles down. My inner critic has little to say. I’m not regretting the past or fearing the future. I’m in the here and now. I’m centered, relaxed, and rejuvenated. I got really curious—what’s was going on? Why had engaging in creative endeavors become so significant in my life? Why did it feel like that had been the single most important thing in my healing (after being sober, that is)? So began my research into creativity and mindfulness. I discovered that Carl Jung used art therapy with his patients. He encouraged the spontaneous drawing of mandalas. He believed that by just letting his patients draw with no interference, they would heal things in their psyche without even knowing it. “There is NO SUCH THING as a mindless doodle,” according to Sunni. CNN reports creative activities impact the body in a way similar to meditation. It’s like yoga for your brain. This was also about the time that “adult coloring” became a billion-dollar industry. Why are millions of adults coloring, I wondered? The more research I did, the more obvious it became. Our society is craving sanity. Coloring reminds us all of the days of childhood when it was okay to pick up crayons and zone out for a bit. Having “adult” coloring books has given millions permission to stop, color, and find peace. What I personally experienced while being creative was mindfulness; my brain was quiet yet active while painting, collaging, sewing, drawing, coloring, baking, and crafting. Being creative somehow taught me the skill, if you will, of paying attention to me, of being mindful. As it turns out, when you are being creative, you are using both your creative self and your analytical self, your left and right brain hemispheres at the same time. This not only quiets your mind, it engages it. You are creating without angst. It kind of just happens. My creative self was reawakened. I was allowing myself to be me, to feel me. Having something creative “in the wings” became important, something to look forward to. Downtime became fun instead of something I dreaded. This is not say that being mindful instantly became an easy process for all the other times when I was not doing something creative. Having gone through some pretty traumatic years, it was “normal” for thoughts of dread, unworthiness, sadness, and shame to rumble through my mind, like the undercurrent of a river when I was engaged in mundane activities. Being alone cleaning, cooking, doing laundry, doing bills, and working was still wrought with angst and despair. I began to yearn for that calm, serene mindfulness I felt while being creative at all times in my life. So I engaged in more creative activities and hung out with people who were on the same path of healing. I began to create a new “family” of people who supported and loved me. I found and became active in a spiritual home. I started to naturally attract friends on the same path of becoming more creative, more mindful, more spiritual, more compassionate and successful in all areas of life. I read The Power of Now by Eckhart Tolle and learned how important it is to notice it all—the good, the bad, and the ugly. Wow, it’s okay to have “bad” thoughts. It’s actually normal. It’s hard. And I learned that it’s my responsibility alone how to handle it. I’ve subscribed to helpful blogs like TinyBuddha.com and mindful.org. I started doing Bikram (hot) yoga. Ninety minutes in a hot room doing yoga brought up a lot of difficult memories. But I stayed with it. I stayed in the room even though I was terrible and even though I would sometimes cry during the thirty-second rest periods between poses as I processed memories of hating my body and feeling ashamed and remembered being teased for being fat. At first I could only meditate with music or a guided meditations for five to ten minutes. I meditated like this sporadically for years. Just recently I started meditating in the morning and before bed at the suggestion of my life coach. She suggested two to five minutes, silently, in the lotus position. I said, “I can do at least ten I’m sure.” Much to my surprise, ten minutes was easy so I progressed to fifteen, then twenty, then thirty. I am now meditating for thirty minutes, alone, no music, sitting in the lotus position (as best I can) twice a day. This I consider a miracle. Meditating like this has also allowed more memories to gently come up and dissipate. Wow. Being mindful is not always an easy road, but it’s a much better path than trying to stuff painful memories, feelings, and thoughts down. It’s much easier than trying to drink them away. Being mindful has helped me be comfortable with my thoughts. Okay, that’s not always true—I still sometimes get angry and want them to go away, but I don’t dwell as much, I don’t lash out as much, and I am most definitely a happier, more peaceful person. If you activate your divine creative energy, you are activating the positive, shiny aspects of yourself. You remember happier times. You feel accomplished. You’re happy with yourself. You smile more (and people smile back)! As you then become more mindful, perhaps through yoga and meditation, the difficult thoughts and feelings are balanced with the positive, creative, and happy aspects of you. You take responsibility for your life. It’s fun to be with you. You realize that you are the person you’ve been waiting for. Kathy has been creating and teaching others to create mandalas since 2000. She’s a guest speaker and artist at retreats and conferences bringing the magic of community art, workshops and mandalas to the attendees. Kathy wrote Activate Divine Creativity: The Life-Changing Magic of the Mandala to help people find joy and mindfulness in their lives. She attributes the mandala to saving her life. 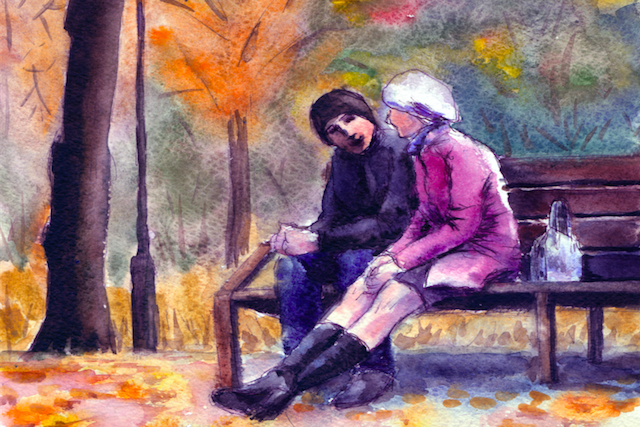 The post How Creativity Creates Mindfulness, Happiness, and Peace appeared first on Tiny Buddha.